26 stations, 67 km. Discover the new transport network for Greater Montréal. The Réseau express métropolitain (REM) is a new automated light rail network. 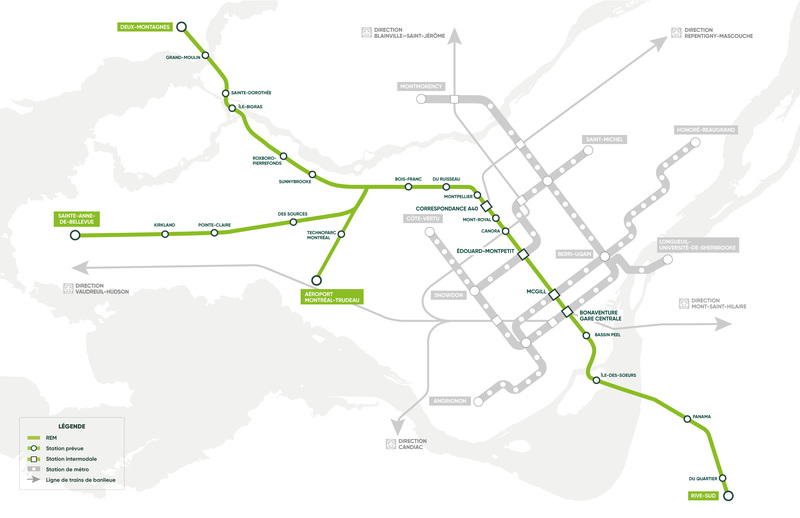 It will include 26 stations and span the greater Montréal area with 67 km of tracks–by comparison, the current metro network is 71 km long! The REM is the largest public transit project undertaken in Québec in the last fifty years. The first trains are expected to start running in 2021 from the South Shore to Bonaventure-Central Station. Then, the other branches of the network will be gradually put into service in 2022-2023. The REM will provide reliable service 20 hours a day, 7 days a week to suit your routine, whether you’re going to work, going home, or going out for the evening or on the weekends. Check our interactive map to see the travel times between stations and the frequency at your future station.